Just a few games into her first season of college volleyball, freshman Kodie Comby is already making an impact. The Texas native was recently honored as the ACC’s Freshman of the Week and was selected to the Georgia Challenge’s All-Tournament Team. Technique: You’ve lived around the world, from Ecuador to the United Arab Emirates. How did that upbringing affect the person you are? Comby: It definitely made me a lot more open to awkward scenarios. Like, when I moved to Ecuador, I knew Spanish, but I wasn’t really comfortable with it and that really helped me … around different situations. Technique: What got you into volleyball into the first place, and when did you begin taking the sport seriously? Comby: I actually started in Ecuador. I did volleyball, golf, swimming, basketball, pretty much everything. Whenever I got back to Houston, my best friend had played volleyball since she was very little, so she told me to play. I started, and I also played basketball in eighth grade, but then that next year I started club, and that’s when it got really serious. Technique: Why did you choose Tech for college? Comby: I knew I wanted to play volleyball. This was maybe my second visit, and I came, I loved the campus, I loved how it’s a great academic school. That’s really important for me. And the volleyball program was slowly getting up there … I met the coaches, and they were also pretty new and I loved them, I love their style of coaching. [Head coach] Michelle [Collier] is awesome …. Just everything about the school is really perfect. Technique: Describe coach Collier’s coaching style. Comby: Well, for example, during practice everything is really fast paced, and she doesn’t like wasting time. … She’s just very supportive in a very subtle way. … She knows what we’re capable of. Technique: What are your responsibilities as a middle blocker? Comby: You kind of have to be looking at everything. You have to know what the setter is doing on the other side of the court. For example, if she tilts her head back, you get the idea that she’s going to go a step behind, … and you’re going to have to try to close that block, slow down the ball, and that’s so that our defenders can get there. And a lot of times whenever we’re on offense, you just kind of call the ball … as if you’re going to get set and then the setter will push it to the outside. That … sometimes goes unnoticed. Technique: You graduated high school a semester earlier and enrolled at Tech in January 2016. Did that help you acclimate? Comby: Definitely, because even right now it’s really different from the spring, just going from preseason into tournaments. 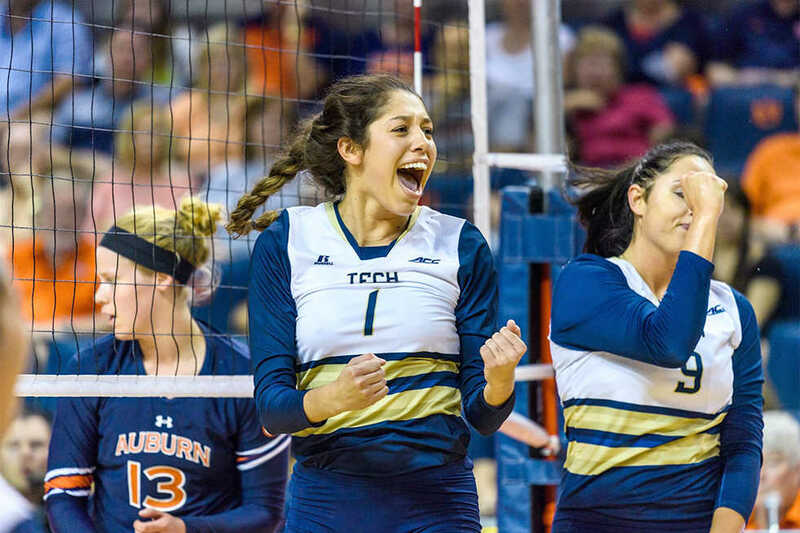 … I just have a lot of work and I think [being at Tech in the spring] helped me get used to how much work I have to do, how to spread my time and it also helped with volleyball obviously. Technique: You’ve played the sport at a few different levels and across the world. What’s the biggest difference between club and college volleyball? Comby: In Ecuador, it was not competitive whatsoever. There was no club volleyball and club is where you got recruited. Once I moved here, I didn’t really understand how competitive it was until my sophomore or junior year of high school. It’s a lot [faster] paced in college. It’s different because in club there’s a lot of good people but the teams can sometimes be not as good … in college everyone is at the same level … so you’ve got to get used to that. Technique: Which team members have mentored you? Comby: The seniors, they kind of showed me directions in little subtle ways. I lived with Lauren Frerking. Lauren was a really big part of that. Obviously the first couple weeks I didn’t really know what to do … so she really helped me with that. But everyone [helped]. We lived right next to Sydney [Wilson], Gabby Benda, Gabby Stavnetchei, and Ashley [Askin] also lived on campus at the time. … I think everybody helped in little ways. Technique: What was it like being named ACC Freshman of the Week? Comby: I was really surprised, obviously, I was really excited. I didn’t really expect that, but … I was just happy. Technique: What is the hardest part of being a student-athlete? Comby: I think just having to know that your priority is finish your homework … and then you also have to realize that you have to work out in the morning and practice later. Technique: Other than being competitive in the ACC throughout the year, what would it take for this season to be a success in your eyes? Comby: I think making it to the [NCAA] tournament is a … goal that we all have. … We have a ridiculously talented team and that would just prove to ourselves that we can do it.